You found it! Advanced custom plastics CNC machining technology combined with experienced, expert machinists. Our 50+ years of machining expertise is built into every plastic part or component we make. As your single-source contract manufacturer for custom machined plastic parts, we make your plastics production efficient and easy. Our extensive machine inventory and team of industry-leading machinists delivers businesses— from multinational conglomerates to individual inventors— reliable products at unrivaled quality. From aerospace to electrical to military, no matter your industry, if you have a custom plastic CNC machining need, K&E has a solution. Explore how our cutting-edge plastic CNC machining capabilities give your project the edge it needs below. K&E CNC machine shop services include precision turning, milling, and routing of plastic parts and components. We’re capable of machining 4 axis of motion via our variety of Haas® CNC machines. Known for our efficiency, precision, and quality, we machine your drawings to order. We get you exceptional and cost-effective results with conventional machining. 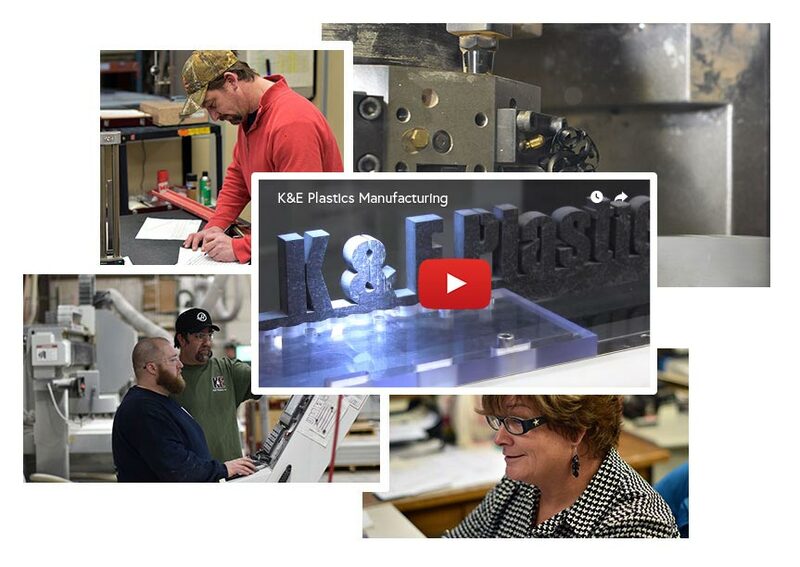 K&E machinists operate industry-leading machinery to expertly mill, turn, and drill plastic parts with unmatched precision. With K&E, you get parts that live up to the task you designed them for. We specialize in plastic fabrication due to our comprehensive knowledge of plastic materials and their characteristics, allowing us to deliver custom plastic parts and components of the highest quality. With K&E custom fabrication, you get the long-lasting plastics your project demands. Entrust your plastics machining project to the expertise and experience of the K&E team. Our machinists have over 15 years of experience in machining plastic materials with unrivaled precision for industry-leading quality. We source materials from the country’s top producers and have extensive experience working with a range of paper-based materials, advanced engineering plastics, thermoplastics, thermosets, and more. We keep your lead times to a minimum. By working with a variety of electronic files, we get your free quote turned around quickly. With over 50 years of CNC machining and hundreds of thousands of past works, you may have come across a K&E part working behind the scenes without even knowing it! With K&E, you get our 50 plus years of expertise and dedication to quality built into every part— saving your project from rejects that delay your timeline and drive up costs. I just wanted to let you know we got the assembly spinning and functional. The parts came out very nice and everyone is very pleased with them, fit and finishing was on point.